I got to play two upcoming games at the New Blood Interactive booth way up on the sixth floor at PAX West this year. The first was DUSK, the retro-styled FPS we’ve covered already, and the second was Tonight We Riot, a side-scrolling co-op mob brawler that was initially described to me as being like “Pikmin meets modern day urban riots.” Not a totally inaccurate description, although there is a bit more to it than that. While Pikmin is a sort of real-time strategy, all based on managing, commanding and dividing your army to efficiently tackle tasks presented to you, all while trying to correctly manage the limited time you get each day to do as much as possible, Tonight We Riot is somewhat simpler. It’s much more based around the brute force, send-all-your-units-to-focus-fire-this-one-enemy strategy. The addition of different weapons and ways of attacking to the mix also changes the formula, as you go from quite literally using your army itself as a weapon to having each member use a certain equipped weapon. These weapons are limited, by the way, and both you and your co-op partner share a common ammunition pool. 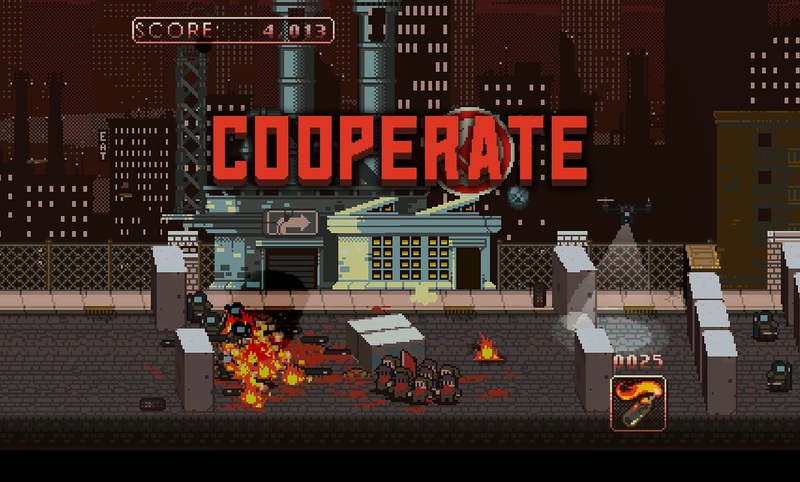 Once you’ve liberated enough factories and built up a sizeable army, the on-screen action becomes downright chaos, as it becomes harder and harder to tell where each commander is yours and which part of the giant mess of workers on the screen are under your control, and where the molotov cocktails will come from when you order your army to attack a nearby group of cops. Of course, you can always just forego weapons entirely and have your army swarm the cops using only your multitude of swinging fists. 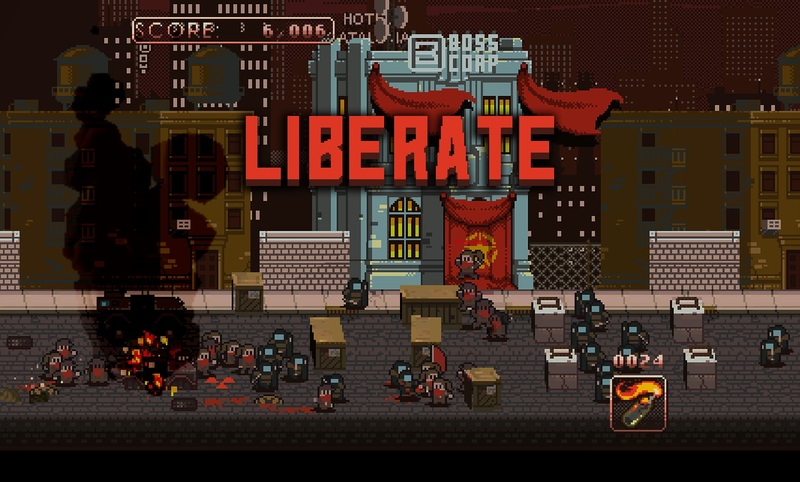 The graphics are all pixel art, with a tiny flag-bearing riot leader leading a squad of tiny liberated workers to take out the tiny police force trying to maintain order. With the riots, the workers seemingly rising up against an oppressive upper class and the abundance of red flags with gold star-based insignias there seems to reflect similar events in the past, with events such as the Russian Revolution. It seems to be a guess about what a similar proletariat uprising would look like if it were to occur in a modern or near-future setting. 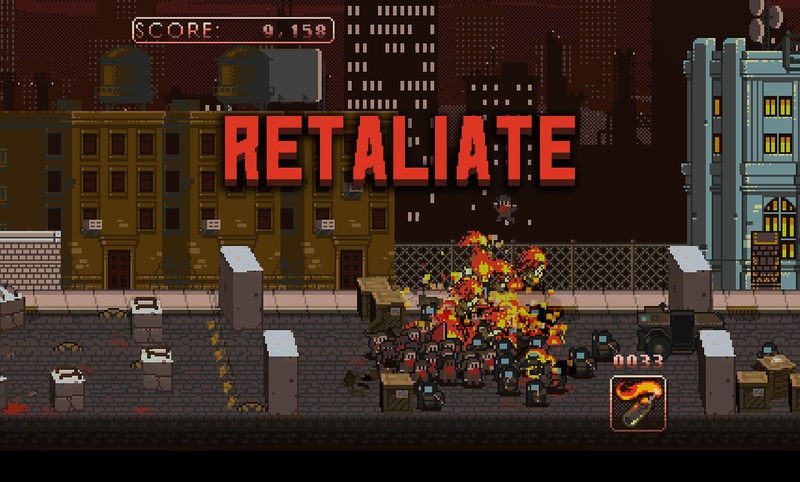 Tonight We Riot is clearly not designed to be a particularly strategic game, like a side-scrolling beat-’em-up compared to a 1v1 fighting game. It’s all built around the brute-force strategy, with no way to direct workers more subtle than making them all go to a place and kill everyone they find there. Of course, it’s always fun to play a game that doesn’t require a whole lot of thinking, and the chaotic mess of action absolutely provides some nice catharsis. We’ll be able to see it in its full form when it hits PC in 2017.